Displays a palette with controls for slipping and sliding various layer settings, such as layer footage source, in/out range, markers, and keyframes. 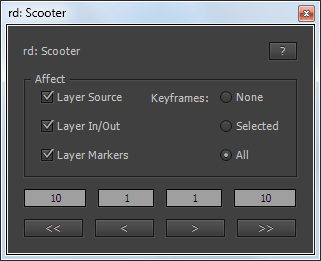 You can use different combinations of these settings for more powerful control over layer editing operations. Note: If you select the Keyframes = Selected option, the script might take awhile to finish, depending on the number of keyframes and the selected settings. Also, this option works on only the first selected layer. There are four navigation buttons that you can use. The frame offset appears above each button, but you can change these to any positive number. These offsets are saved as settings for use in subsequent sessions. Note: Note: This version of the script requires After Effects CS5 or later. It can be used as a dockable panel by placing the script in a ScriptUI Panels subfolder of the Scripts folder, and then choosing it from the Window menu. Originally requested by Stu Maschwitz. Thanks for the challenge. Fixed problem of keyframes changing value if not all keyframes were shifted. Updated minimum version to CS5, added small UI tweaks for CC, and cleaned up some code. MatchRate is an After Effects script for extending a layer property's animation at the same rate. Marker conductor automatically places markers at specified intervals of time or bpm. Quickly find all keyframes that match a specific value and replace them all with a new value in one step. Array makes things much easier for you when you need to duplicate layers a lot of times or change the basic properties of selected layers. Displays a palette with controls for sorting layers based on specific criteria. These are the sample scripts excerpted from Adobe After Effects CC Visual Effects and Compositing Studio Techniques by Mark Christiansen. A complete chapter on scripting by Jeff Almasol is included with the book. Displays a palette with controls for changing the size, pixel aspect ratio, duration, frame rate, preserve options, motion blur, and renderer of the selected compositions, and all nested compositions (pre-comp layers) in it. Renders each of the selected layers separately. You might find it useful if layers represent different versions of an effect or different parts of an effect that you want to render as separate "passes" for flexibility in how they get composited.